Born in England in 1889, Charles Spencer Chaplin is best known for his comical acting as well as his film directing during the era of silent movies. The Tramp was one of everyone’s favorite Chaplin characters. But his career did not end with the arrival of talking films. He co-founded United Artists and was on the board of directors until the 1950s. Lesser known talents of Chaplin included his songwriting with a big hit called “Smile” in the 1950s sung by Nat King Cole and re-recorded by many famous artists including Michael Jackson in 1995. But the 1950s in the US were turbulent times politically and the McCarthy Era anti-communist hearings were in disfavor of Chaplin’s views and associations and he was forced to return to Europe. He lived in Corsier, Switzerland where he is buried with his 4th wife Oona O’Neill who died the same year. Corsier is a small village up on a steep hill from Vevey (near Montreux on Lake Geneva ) and Chaplin lived there from 1953 to 1977 when he died leaving us with these famous words, “Imagination means nothing without doing”. His career in the entertainment field began when he was a child in 1895 lasted until just before his death in 1977 at an age of 88. Married 4 times, Chaplin had 11 children, one who is also a famous actress and philanthropist, Geraldine Chaplin. The family still owns the estate in Corsier. We were all thrilled in Lausanne in 2006 when the Musée L’Elysée exhibited 350 photographs of Charlie Chaplin, affectionately known as “Charlot” here. The Chaplin family had loaned these treasures and we were able to reconstruct the life this famous man in an exceptional and unforgettable exhibition. Imagine the excitement in the city and especially in the Musée L’Elysée, when the Chaplin family recently very generously donated the Chaplin Photographic Archives, an enormous collection documenting the entire career of Charlie Chaplin. The Archives consist of 10’000 photographs with vintage prints and negatives going back to 1910 when Chaplin first toured the US. Chaplin had hired several photographers to document the making of his films from the very beginning. 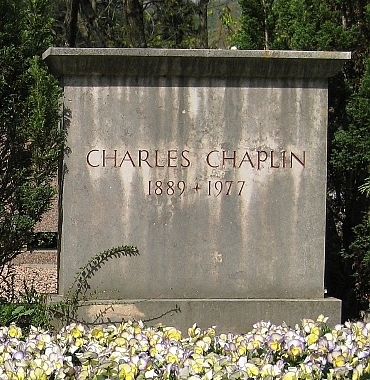 Since his death the archives were the property of the Chaplin family. This is a very significant donation for the Museum which confirms its role as a centre of excellence in the conservation of photographic materials. The Musée de L’Elysée, which has always been a photographic museum, has announced that it plans to create an educational program next year called Ecole du regard (school of seeing) based around these photographic treasures of Charlie Chaplin as well as organizing public exhibitions and creating publications. For more about life and travel in Switzerland follow me on Twitter. 18th Annual Lausanne Marathon: This Year in Halloween Costumes!